Morten Christiansen is technical marketing manager for Synopsys’ DesignWare USB and DisplayPort IP. 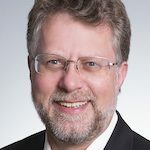 Prior to joining Synopsys, Christiansen was a principal system designer at ST-Ericsson and Ericsson, designing mobile phone and modem chipsets for 19 years. He was also member of technical staff at ST-Ericsson. The 20Gbit/s data rate of USB 3.2 comes with its share of challenges. This article describes applications that benefit from the latest USB specification, explains the basics of USB 3.2, describes what to consider before implementing USB 3.2 technology in your next SoC design, and how USB Type-C connectors and cables are used in USB 3.2 systems. Many common applications are already outgrowing the capabilities of USB 3.0. For example, USB 3.0 connections work well for mass-storage devices based on hard disk drives, but form a bottleneck for flash-based solid-state disks (SSD). USB 3.2-based mass-storage devices, connected at 20Gbit/s, offer more than four times the throughput of USB 3.0 and can keep up with the latest SSDs. Industrial vision systems are facing similar issues, especially since they usually can’t use data compression. In these systems the process of capturing images, processing them and taking appropriate action, such as removing an item from a high-speed conveyor belt, is time sensitive. USB 3.2 enables such time-sensitive systems to support higher resolutions and/or higher frame rates. Automotive systems do not normally support USB 3.1 Gen2 connections due to cable length and proprietary automotive connectors. However, automotive applications can take advantage of USB 3.2 Gen1x2 connections, which offer twice the throughput, at 10Gbit/s, of USB 3.1 Gen1. Firmware engineers and software developers can use the increased bandwidth of USB 3.2 to replace dedicated trace and debug ports. USB 3.2 allows the use of an existing Type-C connector, standard USB cables, and PCs/laptops to capture high-bandwidth trace and debug data. Both USB 3.2 Gen2x1 and Gen1x2 provide a 10Gbit/s raw data rate. However, due to the more efficient line encoding for Gen2, throughput for Gen2x1 is approximately 1.2 times greater than for Gen1x2. Both 10Gbit/s connection speeds are needed and support different use cases. USB 3.2 takes advantage of the four differential SuperSpeed/SuperSpeedPlus pairs present in the USB Type-C connector, unlike USB 3.1 and USB 3.0, which used one or the other TX/RX lane pair, depending on the orientation of the Type-C connector (Figure 1). A USB 3.2 implementation achieves a 20Gbit/s data rate by lane striping and lane bonding (e.g., splitting and combining data) with two USB 3.1 (10Gbit/s) lanes. USB 3.2 also supports 10Gbit/s by striping and bonding two USB 3.0 (5Gbit/s) lanes. USB 3.2 supports USB Type-C features such as alternate modes, power delivery, and digital audio. Figure 2 illustrates USB 3.2 lane striping and lane bonding. In USB 3.2 Gen Xx2 mode, the host and device controller run TX paths at twice the speed of a single-lane USB 3.1 or USB 3.0 connection. Payload data is split (striped) across two TX/RX lanes in the PHY and cable and combined (bonded) in the host and device controller RX paths. USB Type-C supports power, audio, video, and data on the same cable. Type-C connector lane usage that supports USB and/or DisplayPort is shown in Figure 3. 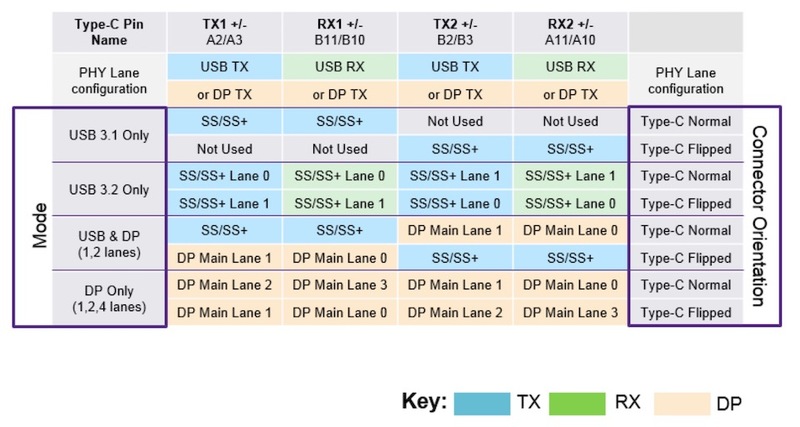 The required switching between USB TX or USB RX, DP TX, and Not Used pins (Figure 3) for each lane and each use case is best handled by a digital switch that is integrated in the PHY to preserve signal integrity. In Synopsys USB/DisplayPort PHYs, switching is handled by the Type-C Assist (TCA) function (Figure 2). Just as the USB 3.1 programming model did not change from USB 3.0, the programming model for USB 3.2 host and device controllers does not change to support x2 connections. USB 3.0, USB 3.1, and USB 3.2 xHCI compliant host controllers all use the same xHCI host software stack. Similarly, Synopsys’ USB device controller uses the same device software stack for USB 3.0, USB 3.1, and USB 3.2. However, 20Gbit/s throughput can reveal operating system and/or CPU and memory bottlenecks that were absent at 5Gbit/s or 10Gbit/s. Also, device class drivers and/or device functions such as mass storage, networking, and video may need to be optimized to take advantage of the new 20Gbit/s connection speed. USB Type-C is a small, robust connector suitable for PCs, laptops, tablets, phones etc. Type-C connectors can be plugged in either way up. USB Type-C is becoming the new standard USB connector for most consumer products. 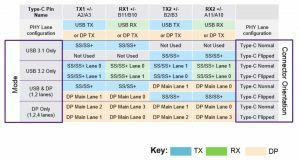 The USB Implementers’ Forum (USB-IF) is emphasizing the transition to Type-C by moving the USB cable and connector chapter to a separate document and renaming the standard-A, standard-B, and mini/micro connectors as legacy USB connectors. All passive USB Type-C cables can be used for USB 3.2 GenXx2 connections since four SuperSpeed/SuperSpeedPlus differential pairs are mandatory per the USB Type-C specification. A passive cable designed for Gen2 (10Gbit/s) is limited to approximately 1m in length and can support the new 20Gbit/s connection speed. Passive cables of 2 or 3m long, designed for Gen1 (5Gbit/s) can support the new 10Gbit/s (5Gbit/s x2) connection speed. Active cables are used to extend USB Type-C cable lengths beyond 1m for Gen2, and up to 5m for Gen1. Existing active cables may not support four differential pairs, since this is not required for USB 3.0 or USB 3.1. Active cable specifications are being defined by USB-IF (USB) and VESA (DisplayPort) working groups to ensure that future active cables will work seamlessly with USB 3.2 connections, including DisplayPort alternate mode. USB 3.2 offers increased bandwidth and USB Type-C connector and cable support, if users can overcome the challenges of implementing it. Synopsys is developing USB IP to the latest USB standards for use in high-performance SoCs, using knowledge derived from thousands of successful customer design wins. Learn more in Synopsys’ USB 3.2 demonstration, showing a USB 3.2 Host and Device communicating at USB 3.2 speeds over a standard USB Type-C cable. Christiansen has contributed to more than 25 USB and MIPI standards, including USB 3.1, battery charging, Audio 3.0, HSIC, SSIC, gigabit debug for USB, high-speed trace interface as well as communication standards including WMC, EEM, NCM and MBIM, which are used in billions of USB products. In addition to the non-patented USB standards contributions, Christiansen holds six international patents for other USB inventions. Christiansen holds a Master of Science degree from The Norwegian Institute of Technology (NTNU) 1983.